For 25+ years, I have been promoting optimal health and lifestyle by facilitating workshops and seminars on a wide spectrum of topics. My speaking style is an easy-to-understand manner with real-life anecdotes to offer an informative and pleasant learning experience for all participants. Whether your group is interested in fitness, eating for health, risk factor identification and modification such as diabetes or heart disease, or relaxation for stress management, I have the clinical knowledge to provide relevant, science-based information. Let me bring my inspiring message about achieving optimal health to your company, professional group or service organization. RECENT CLIENTS include Vistage, Eskaton, MHA Law, Highgate Senior Living, Nevada County Association of Realtors, SeeJaneDo, St. Mary’s Hospice, and Business and Professional Women. Managing Daily Stress – Our culture rewards a fast paced life. Learning to elicit the relaxation response by spending just a few moments each day quieting the mind can improve your physical and emotional well-being. What You Eat Matters – The demanding schedule of the busy professional may not include foods that support optimal health. You will learn the perils of fast food and more importantly, the benefits of eating well. 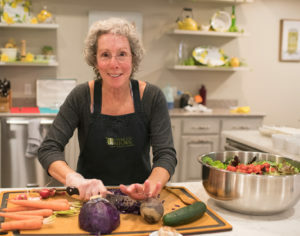 Robin will disclose her tricks-of-the-trade that will give you the information you need to eat healthful foods. Know Your Risk Factors – Learn about the risk factors that lead to coronary disease and diabetes: LDL cholesterol, post meal glucose and C-reactive protein levels, blood pressure, BMI, fitness, stress, and personal satisfaction, to name a few. Behavior Change – Willpower alone does not lead to healthy behaviors! Understanding the fascinating science of mind-body medicine leads to behavior change that will support optimal health. Contact Me for a more comprehensive list of topics and details. “Your presentation is always worth the hour”.